"That's definitely going in my part of the Edda." 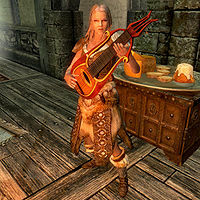 Lisette is a Breton bard who lives and performs at the Winking Skeever in Solitude, spending most of her day there. When you first enter Solitude, Lisette will be one of the townsfolk present at Roggvir's execution. Afterwards, Lisette spends her entire life at the Winking Skeever, singing, playing, and taking requests around the clock. She occasionally sits down for a bite to eat and during the night, she will prefer to sit in the upstairs area and relax. After you have completed the quest Tending the Flames, this routine changes; she starts leaving the inn at 9am and spends three hours in the courtyard outside the Bards College, talking to Una and Vivienne Onis. At noon she returns to her duties at the Winking Skeever. She wears scaled boots and scaled armor, and carries a belted tunic, an iron dagger, and a selection of common items and gold. When you first enter Solitude, Lisette will be present when Roggvir is about to be executed. If you speak to her, she will reject you with: "Sorry, I need to pay attention so I can remember this." After the beheading, an amused Lisette will comment: "That's definitely going in my part of the Edda." and return to her duties at the Winking Skeever. Inside the tavern, she maintains a pleasant demeanor as a bard by telling the player, "Feel free to make requests. ", "There's nothing like a good song to lift the spirit in troubled times." or "Have a drink, rest your feet and stay a little while." If you ask her if she is a member of the Bards College, she will respond: "Only in that I'm a graduate. I work at here at the Winking Skeever. I would highly recommend it though. Talk to Viarmo if you're interested." When asked if she makes a good living as a bard, she responds "Oh, no. But being surrounded by good music, good drink, and good friends is all I've ever asked for." She refuses to spread local gossip and directs the player to innkeeper Corpulus Vinius: "Generally, if you want rumors, you should talk to Corpulus. That said... I did see a visitor pass through on his way to the Blue Palace." When exiting conversation, she keeps an inviting attitude with comments such as "You should think about staying the night. Corpulus keeps a clean inn." or "Stick around! Still plenty of songs to sing and mead to drink." Lastly, if you have joined the Bards College she will greet you with an ironic: "Uh oh. A fellow bard. I best not miss my notes or forget any lyrics." Lisette: "It's too bad the Burning of King Olaf was called off this year. I think some of the younger bards would really have gotten a kick out of it." / "I think our flutist here has gotten better since the Burning of King Olaf." Vivienne: "Well, you can understand Elisif not wanting it. It is a shame though." / "I'm so glad we got to have it. I thought for sure Elisif would never consent." Vivienne: "Do you miss your days training at the College?" Lisette: "Absolutely not. I prefer to be near enough to come visit but free to come and go as I please." Vivienne: "I could listen to him/her play all day." Lisette: "He's/She's okay. A little breathy and a little harsh on the notes." Vivienne: "Speaking of harsh. You Bards don't cut each other any slack do you?" Lisette: "Not in our nature." Una: "I keep coming out here thinking I'll see what others see in this... frivolity." Lisette: "Your [sic] a hard woman to please Una." Una: "I'm pleased when the palace is clean, I'm pleased when the beds are made on time, I'm pleased when I [sic] Erdi isn't around. Most of those don't happen very often."